Seattle Police Chief Kathleen O’Toole has extensive experience in policing in Ireland and called the nomination a “huge honor,” but she said it would not distract her from her work in Seattle. Police Chief Kathleen O’Toole has been nominated to a newly created commission overseeing policing in Ireland, but she plans to remain on the job in Seattle. “I’m not walking away,” O’Toole said Tuesday while discussing her new position heading the Commission on the Future of Policing in Ireland. O’Toole, who has been police chief in Seattle since 2014, was the chief inspector of Garda Siochana Inspectorate, an agency that inspects the operations and administration of Ireland’s national police force, from 2006 to 2012. She was also a member of the Independent Commission on Policing for Northern Ireland, the Patten Commission, which was established in 1998 to inquire into policing in Northern Ireland. She said other details of the position are still being worked out. 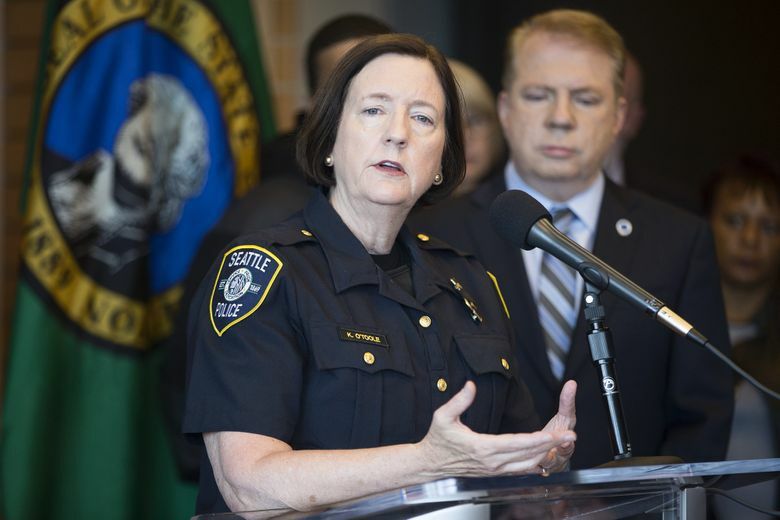 O’Toole said that her work on the commission would not be a distraction and that she remains fully committed to the Seattle Police Department as it works to fulfill the requirements of a consent decree with the federal Department of Justice. The Government of Ireland created the Commission on the Future of Policing in Ireland last month in response to a series of recent controversies involving the nation’s police force, according to The Irish Times. The commission will examine recruiting and training of police, the culture and ethos of policing, oversight and accountability, the newspaper reported. O’Toole was Boston’s police commissioner from 2004 to 2006. Steve Miletich: smiletich@seattletimes.com. Information from Seattle Times archives is included in this story.